« Day 249 – Yudith A. Day 250 – Matt W.
“Be not afraid of greatness: some are born great, some achieve greatness and some have greatness thrust upon them.” – William Shakespeare, Act II, Scene V of Twelfth Night. 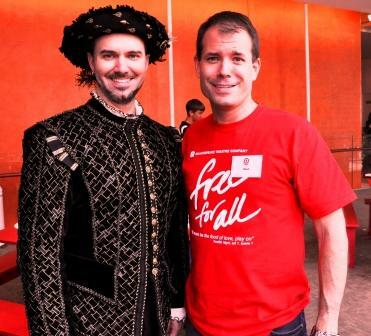 I’m in a Shakespearean mood since on Day 250 I spent the day at the Sidney Harmon Hall helping out with the Free For All, a free event that the Shakespeare Theatre Company has produced every year for about the last 20 years. In addition to having two free weeks of Shakespeare’s classic Twelfth Night, on Saturday there was a wonderful all day event for families where children got to explore their creativity and knowledge of theatre and the arts. I have dabbled in theatre since my teenage years and had fun helping kids understand the world of Shakespeare as well as helping them with more tangible tasks such as coloring. While I was helping the children color their tote bags with special markers that write on fabric a very famous individual walked by: William Shakespeare. I was pretty startled, but the show must go on so I continued with my work. At one point though I realized that I might be able to steal a few minutes with the great bard and give him my $10. The rest is history. Matt was born in Danville, Pennsylvania but grew up in Tennessee. He holds a BA in Philosophy from Columbia University and an MFA in Classical Acting from the Shakespeare Theatre Company’s Academy for Classical Acting at The George Washington University. He is currently working towards a PhD in Renaissance Theatre History at the University of Maryland. He is also the Founding Artistic Director of the not for profit Theatre Company, Faction of Fools, which is managed by his wife Sarah. Around for about a year, Faction of Fools focuses on mostly Commedia dell’Arte productions. “These are plays that are very funny, very silly and very energetic,” says Matt. The Commedia dell’Arte began in Italy 500 years ago and quickly spread throughout Europe and continues to live in theatres around the world today. Its emergence during the Renaissance marked the beginning of professional theatre in the West; furthermore, the comic characters, themes and devices employed by early Commedia troupes influenced artists from Shakespeare, Moliere and Goldoni to The Blues Brothers, American musical theatre and contemporary sit-coms. I thought I would ask young Shakespeare a few things about his life. He told me that he was born in 1564 and although his exact birth date is unknown it is commonly believed that he was born on April 23rd since he was baptized on April 26th and 3 days were commonly passed before baptism. In addition to this, the fact that he died on April 23rd, 1616, many historians hold steadfast to the April 23rd date for both is birth and death. Although Mr. Shakespeare would have preferred to receive pounds and shillings, he readily accepted the ten dollars and promised to donate it to the Faction of Fools Theatre Company. DC residents have an opportunity to see Matt this November at the Wooly Mammoth Theatre. He stars in The Great One-Man Commedia Epic, single-handedly bringing to life 12 characters drawn from historical Commedia dell’ Arte. It’s a hilarious tale of some common Shakespearean themes that come together to bring an entire town to the brink of tragedy before love prevails, normalcy is restored, and comedy triumphs. It’s on my calendar, maybe I’ll see you there? on September 14, 2010 at 5:30 pm | Reply Matt W.
On behalf of Faction of Fools Theatre Company, thanks for the $10 donation, which is now in the process of buying us a hat for one of our characters! One tiny correction to your great blog: unfortunately the PhD has not yet been conferred. In fact, it’s years away… But the research is great, and I’m very happy at University of Maryland. Thanks again, Reed, and all the best in this exciting project. Oops, sorry about that Matt. I think I corrected it now. Great hearing from you and look forward to seeing you at the Wooly Mammoth in November and at the year-end celebration for the Year of Giving in December!